JK Business School believes in creating management professionals and future leaders who are ready for the challenges of the global market. That’s why it has always tried to offer its students International exposure, which is vital to their learning experience. Seven students from the institute benefited from that recently as they were in Singapore for a three day “Tomorrow’s India” conference. Held between the 24th and 26th of January, the event also saw cultural and academic sharing amongst students from both the countries, which was a unique experience on its own. 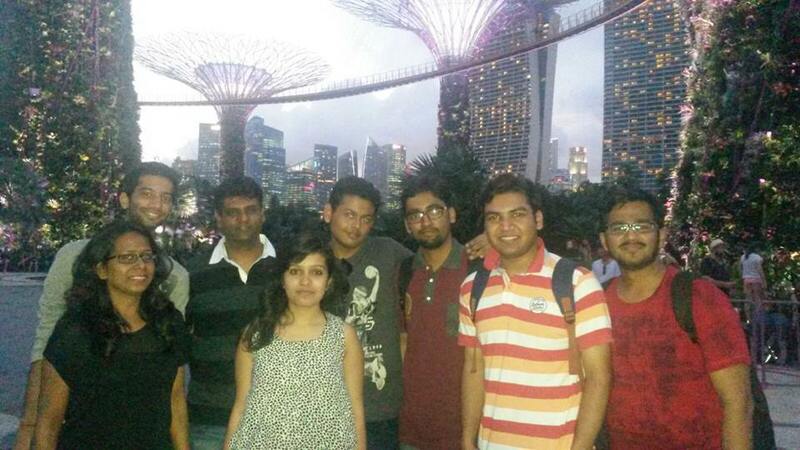 The students who made it to Singapore for the conference were: Saransh Patni, Sushant Pareek, Parth Gaur, Saurabh Sharma, Ashish Saxena, Priyanka Pandey and Prerna Pandey. They were a part of high profile sessions where they interacted with a “who’s who” of the business and academic world. But their institute and the organizers also made sure that they gain firsthand experience of the student life in Singapore. That’s why their trip was marked with University visits that had a lot in store for them. They were impressed further as they visited Nanyang University, which is known for its unique hive-like design that is better suited to the contemporary needs of learning. The structure leads to a casual interaction amongst students and faculty members. It also means faculty members can engage them more, and students collaborate a lot better amongst themselves too. And they were quite happy to interact with the students from JKBS, showing them around and sharing ideas and aspirations. The group also made it to the National University of Singapore, which is the country’s flagship university with a global approach. It has 37,000 students from over 100 countries studying in 16 streams. It also has three Research Centres of Excellence (RCE) and 23 university-level research institutes and centres. “Just being at a university of such magnitude was an amazing experience. We were shown all the facilities, including the sprawling library that had us quite curious. It was truly one of the highlights of the trip for us,” said Ashish Saxena. From classroom learning to on-campus interactions, the exposure offered to students was comprehensive. It was nicely rounded up with the visit to the Action Community by Entrepreneurship, Singapore’s special platform for start-ups and young entrepreneurs. Here the students were inspired by the stories of young entrepreneurs, who shared their vision and passions. “We loved hearing their stories because they were quite motivating. The way they faced their challenges gave us the courage to pursue our dreams too,” said Prerna Pandey. That’s how an exciting, once-in-a-lifetime International trip came to an end. The trip gave students important global exposure, which is another goal for the institute. After all, this wasn’t the first time students from JKBS had embarked on a foreign journey. Last year, four students from the B School had gone to California State University, Monterey Bay on an exchange program. Also, it is important to note that the Govind Hari Singhania Global Leadership Award reduced the financial burden on students, who studied at the prestigious university for one term. The latest Singapore sojourn was another fulfilling and enriching global experience for the students.